Hey, Wisconsin Got Two Votes! ~ The Bucky Channel - The World of Sports from Wisconsin's Perspective. Home » Cleveland State , Marquette Golden Eagles , NCAA Basketball Rankings , Ohio State Buckeyes , St. John's University , UW-Green Bay Fighting Phoenix , Wisconsin Badgers hoops , Youngstown State » Hey, Wisconsin Got Two Votes! With NBA All-Star weekend in full swing, I have to admit that the Badgers and Marquette games on Saturday kind of got pushed to the backburner. Even though both were victorious the other night, I decided I would rather watch the skills competition and slam dunk contest as opposed to either team's games. Call me what you will, but the dunk contest is awesome. I have no regrets. What I missed though was two teams on the rebound in their quest for postseason success. 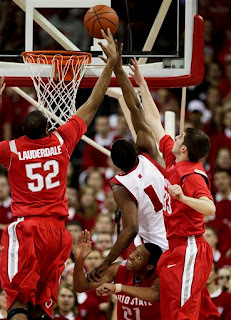 The Badgers rattled off their fourth straight win on Saturday when they beat Ohio State 55-50 at the Kohl Center. The Badgers turn around has been in large part because of their defense, averaging just 49 points allowed per game during their current winning streak. That might not be enough to get you recognition in the ESPN / USA Today Coaches poll, but it does get you two votes in the AP version! Congrats, Wisconsin! Marquette broke their two-game losing streak on Valentine's night with a 73-59 win over St. John's. Their week keeps them at the number ten spot in the Associated Press poll, while they move up one spot in the ESPN / USA Today poll, now tied at number eleven. An interesting week for state hoops, but one that ended on a high note. Unless you're UW-Green Bay, who celebrated their recognition from the Associated Press by dropping games to Youngstown State and Cleveland State this week. Oh well.